Ananya Balaji is a long term Indonesia resident and currently a 11th grader. She is also a dance disciple of Smt Janaki Raj Shrikanth, Prarthna Fine Arts in Jakarta. Her Bharatanatyam Arangetram (Classical Indian Dance Debut) is on Sunday, September 23rd , 2018 at Goethe Institut, Jakarta. Indoindians had the opportunity to meet with this lovely young dancer and she shared these thoughts with us. A passionate art enthusiast, currently a 11th grader, with various hobbies such as reading , baking and watching movies. 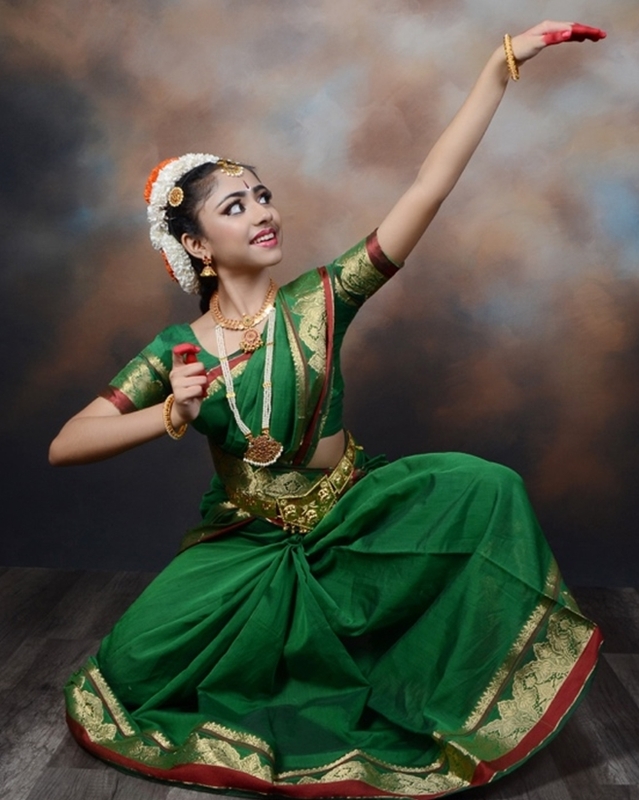 I am exceedingly passionate about Bharatanatyam and the interest stemmed when I was very small. At first, I wanted to be a ballerina and even proceeded to learn it for a couple of years. However, when I was first exposed to Bharatnatyam, my interest in ballet fizzled out and that was when I knew what I wanted to pursue. In addition to dance, I am also learning the veena(a type of sitar) and Carnatic vocals. Despite having ventured into different aspects of fine arts, I do know that Bharatnatyam is something that I never want to stop. India has an abundantly rich , diverse and beautiful culture, one of its treasures being its art forms. We have 8 classical dance forms, and to be learning one of them whilst residing away from India, is something that makes me feel immensely grateful. It really wouldn’t be possible without my guru and my parents. My parents constantly encourage me to stay linked to our Indian cultural heritage be it by dancing Bharatnatyam, reading Epics like Ramayana, listening to Indian classical music and learning to play the Veena. Who is your Guru and can you share you experience with them? My illustrious guru is Smt. Janaki Raj Shrikanth, and it was mainly because of her I wished to pursue a journey in dance. When I was six, I went for my first Bharatnatyam concert, which was directed by none other than my guru. Mesmerized, I realized that this is what I wanted to learn and whom I wanted to learn it from. My guru is a wonderful, selfless and enthusiastic person, brimming with love and affection and wants only the best for her disciples. I am grateful and feel blessed. Was there a regime to prepare for the Arangetram? Yes, there was. A year before the arangetram is when the practice got serious. In addition to dancing, I had to do other things such as stamina training as well as some yoga. We had a planned schedule which I had to adhere to. For me it’s a long awaited moment, I feel excited about my first solo dance concert and I am praying that it goes well with God’s grace and my Guru’s blessings. What are your plans with dance? Do you plan to continue studying this, take it as a career? I love to dance Bharatanatyam and I certainly do plan to continue studying this beautiful art form. I hope to venture into other dance forms such as kathak and kuchipudi someday. I really don’t know what life holds in store for me, but taking dance as a career sounds marvelous. What advice would you have for other youngsters interested in traditional dance forms? Traditional art forms are intrinsically technical and aren’t things to be considered as a mere hobby. It requires a certain measure of sincerity and passion. The journey could be painful in the initial stages as the muscles would have to strengthen, but being patient enough to get through that helps one unravel the true beauty of dance. Bharatanatyam is a test of physical and mental strength, and it’s definitely worth it! Who is your favourite exponent of Bharatnatyam and why? Honestly, there are so many but some of my favorites include Leela Samson and Priyadarshini Govind. I adore all their recitals and their perfect technique, astounding expressions and remarkable poise which entrances and inspires me.